How do you guys organize your socks? I have two groups of socks - athletic and dress. And I'm having a hard time finding anything that would help me organize them. I was looking for grids for my dresser but couldn't find any at Amazon. The land of sky blue waters. A quick search for drawer organizer at Target.com lead me to the Dial Dream Drawer organizer which is 4 spring loaded dividers that should fit into the average sock drawer. You can check to see if they have it at a local Target, or have it sent to you. I just throw all my socks into one drawer (I do pair them though). I've got thin/normal dress socks, funky/novelty dress socks, wool dress socks, wool hiking socks, no shows, athletic crews, and toe socks for my 5 Finger shoes all jumbled together. I've never found myself wishing I had a better organized drawer as it only takes all of a couple seconds to rifle through the drawer. I have this SAME EXACT PROBLEM! Someone on the forums here directed me to a sock organizer from Amazon. Basically it was just a box with a bunch of dividers that sat in your drawer. Did I ever get around to purchasing it? Nope. Are my socks still a mess? Yup. At some point then space was no issue, I had socks separated by color (gray, brown, navy and other) and kept in shoe boxes in my closet. Athletic and boot socks were in another location to begin with. Currently I have my socks in one drawer and it is a bit more difficult to find what I want in the morning, but I can still manage to enjoy life. Athletic sox are in one drawer separated by white short, white long, black short, black long, and winter wool in the back. The other drawer has dress sox sorted by color. Colors I wear less often are in the back. I have an $8 sock organizer from Amazon. 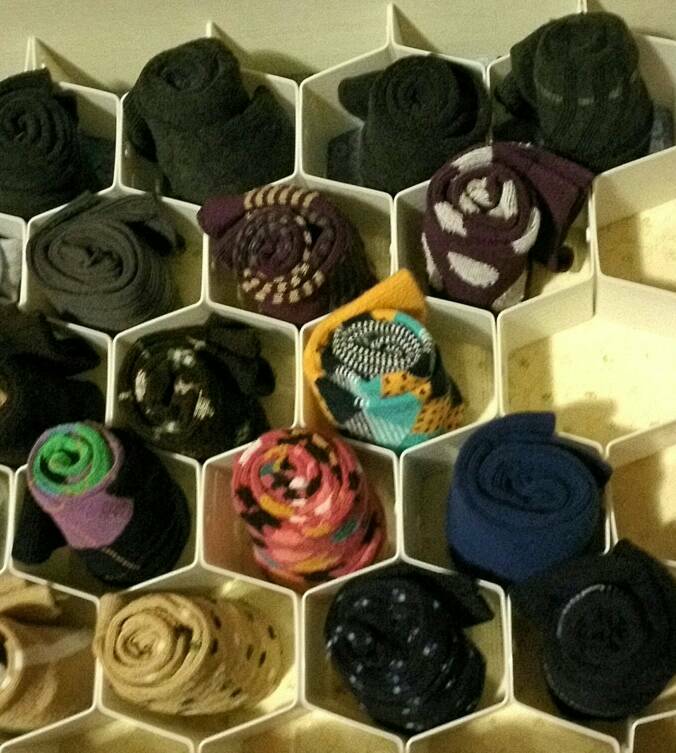 The sock organizer is not great quality, but it separates socks just fine. I enjoy organization and seeing things laid out. There are times I would find a pair of socks that I haven't worn in 6 months! @ianr That's what I'm talking about! I need to order something like that. Would help immensely.